Banana Tree – Musa spp. Musa acuminata Colla (syn.s M. cavendishii Lamb. ex Paxt., M. chinensis Sweet, M. nana, M. zebrina Van Houtee ex Planch.). Hybrids of M. acuminata and M. balbisiana are sometimes given the names Musa X paradisiaca L., Musa X sapientum L., or perhaps most accurately, M. acuminata X M. balbisiana Colla. However, a shorthand method of distinguishing hybrids and accurately representing their parentage was developed in the 1950s, and is commonplace today. Each type is given a 2 to 4 letter designation consisting of A’s representing acuminata, and B’s, representing balbisiana. For example, AA represents a diploid type derived only from M. acuminata, and AAB represents a triploid type with 2/3 M. acuminata and 1/3 M. balbisiana parentage. In general, the most important banana cultivars in the world are AAA, and plantains are mostly AAB, ABB, or BBB. Banana – major cultivars include ‘Gros Michel’ , ‘Mons Mari’, ‘Williams’, ‘Williams Hybrid’, and ‘Grand Nain’ the most popular one in the USA. Plantain – cultivars include ‘French’, ‘Horn’, ‘Bluggoe’ , ‘Pelipita’ , and ‘Saba’ . Edible Musa spp. originated in southeastern Asia, from India east and south to northern Australia. Early Filipinos probably spread the banana eastward to the pacific islands, including Hawaii, prior to recorded history. Westward, banana likely followed the major trade routes that transported other fruits, and it is known to have arrived in east Africa around 500 AD. Bananas were not carried to Europe until the 10th century, and Portuguese traders obtained it from west Africa, not southeast Asia, during the age of discovery. Plants were taken from west Africa to the Canary Islands and South America in the 16th century, and spread throughout the Caribbean with settlement of the area in the 16th-17th centuries. 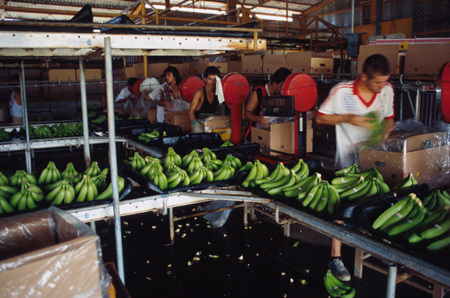 Bananas are now grown pantropically in more countries than any other fruit crop in the world. 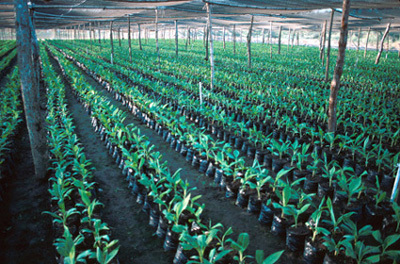 Both banana and plantain trees are large, herbaceous monocots, reaching 25 ft in some cultivars, but generally 6-15 ft tall in cultivation. Plantains are often larger than bananas. The “trunk” or pseudostem is not a true stem, but only the clustered, cylindrical aggregation of leaf stalk bases. Leaves are among the largest of all plants, becoming up to 9 ft long and 2 ft wide. Margins are entire and venation is pinnate; leaves tear along the veins in windy conditions, giving a feathered or tattered look. There are 5-15 leaves on each plant, with 10 considered the minimum for properly maturing a bunch of fruit. The perennial portion of the plant is the rhizome, which may weigh several pounds. It is often called a corm. It produces suckers, or vegetative shoots, which are thinned to 2 per plant – one “parent” sucker for fruiting and one “follower” to take the place of the parent after it fruits and dies back. It also produces roots and serves as a storage organ for the plant. The inflorescence is a spike. Initially, it appears above the last leaves in an upright position, and consists only of a large, purple, tapered bud. As the bud opens, the narrow, white, tubular, toothed flowers are revealed, clustered in whorled double rows along the stalk, each cluster covered by a thick, purple, bract. The flower stalk begins to droop down under its own weight after opening; the flowers are negatively geotropic, and turn upright during growth. 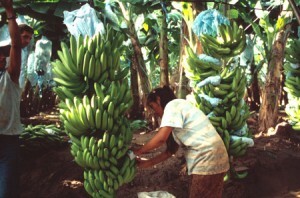 Bananas are male sterile, and those of the Cavendish group are female sterile as well; fruit is set parthenocarpically. An epigynous berry, fruit are borne in “hands” of up to 20 fruit, with 5-20 hands per spike. Fruit reach harvest maturity in 90-120 days after flower opening. The terminal bud on the stalk may be removed if fruit set is high, to allow more complete filling of fruits (sort of like thinning) since this organ continues to grow throughout fruit development. A Giant Cavendish bunch weighs over 100 lbs and contains 300-400 marketable fruits. 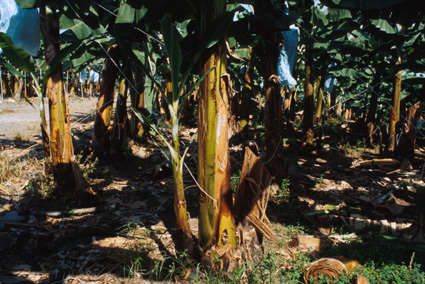 Deep, well-drained alluvial soils are best, but bananas and plantains can tolerate a wide variety of soil conditions. Both banana and plantain are adapted to hot, wet, tropical lowlands. Mean annual temperatures are 80 F, with minimum and maximum daily temperatures of 72-90°F. Growth ceases when temperatures drop below about 56°F, and temperatures below 50 F can cause chilling injury to fruits. Plants require about 4 inches of rain/month, with dry seasons no longer than 3 months. Spacings range from 6×10 to 12×15 ft.
Training and pruning – Propping or guying is performed most cultivars with heavy fruit stalks. Fruits can be harvested when about 75% mature; occurs at 75-80 days after opening of the first hand. Harvest may be delayed up to 100-110 days after opening of the first hand. Entire bunches are cut from pseudostems by hand, and carried on the shoulder or back to a nearby tram line for longer distance transport. The cutter leaves a portion of bare stalk as a handle for transporting to the packinghouse. 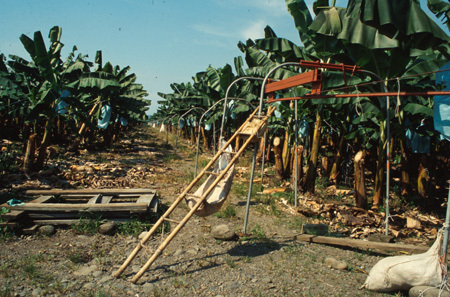 Banana bunches are hung on tramways and pulled out of plantings by tractors or people. Hands are cut into units of 4-10 fingers, graded for both length and width, and carefully placed in poly-lined 40 lb boxes. Fruit are shipped by boat when green, and ripened by exposure to ethylene gas (1000 ppm for 24 hr) at their destination, in sealed “banana ripening rooms”. Fruit can be stored for a short time after ripening at temperatures no lower than 55 F, since fruit are susceptible to chilling injury. Other than fresh consumption, bananas & plantains are used in numerous ways. Banana puree is made into baby food and ice cream, as well as baked desserts. Flour can be derived from dried fruits, and used for pastries or mixed with other flours. Dried fruit of both banana and plantain are commonly made into chips by frying slices in oil and salting. Larger slices are deep fried and eaten like french fries in many countries. Mofongo is fried green plantain mixed with seasoned pork. As with most fruits, the fermented juices are made into beer and wine, commonly in Africa. The young leaves and terminal inflorescence buds are edible. Per capita consumption of banana is 25.8 lbs per year, higher than most other fruit crops.